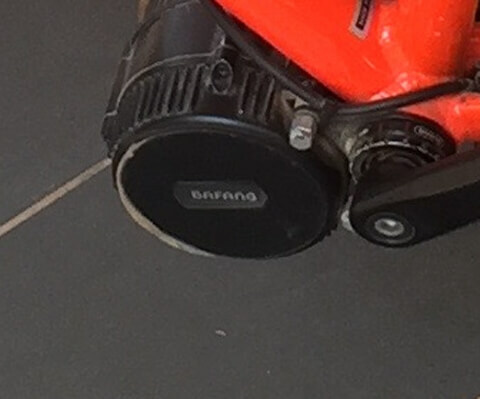 We have a qualified staff and are the first company to built our own E-Bike in Cambodia. 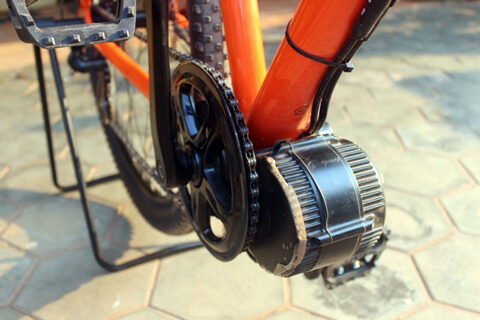 Our local mechanics provide the services on our bikes and can easily transform your own MTB in an E-Bike (electric assisted bike). We made it! 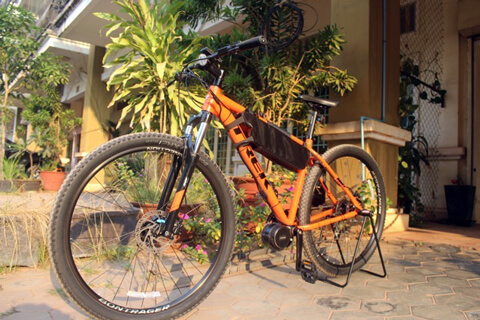 First quality e-bike (electric assisted bike) built in Cambodia. 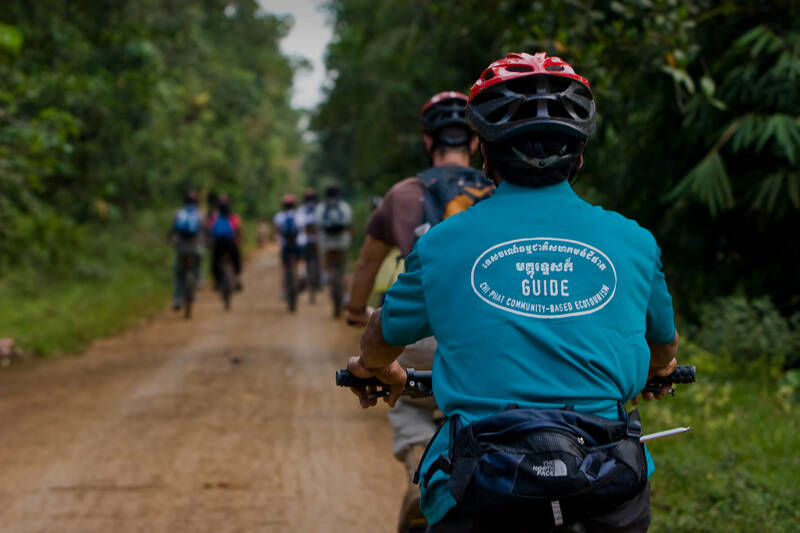 Terrecambodge and Bikingcambodia are now able to offer all cycling tours for different ability levels. In order to assure you a completely carefree joyride – all our bicycles are checked regularly by our experienced mechanics. The electric bikes brings a real ease on uphills and makes cycling a real pleasure on whatever conditions you meet on the roads. Thanks to electric assistance, you can achieve great distances without tiring or sweating. If you experience knee pain or exercise induced asthma for example, electric bikes can breath new life into the sport of cycling. E-Bikes can go 30-90 KM per charge, and a fully charged e-bike can go 120 KM on gentle terrain. As we have removable batteries, any plug in will do it to charge it overnight while you are sleeping in the hotel. Our guide will take care of it. Cycling becomes easier for people of varying fitness and experience thanks to our special designed E-Bikes. Our E-bike brings a helping hand to make longer distances and lesser effort on difficult roads and uphill. Different ability levels can be managed by E-Bikes. One person might follow the group easily, the other might have difficulties and needs assistance. Not much fun for the one who has to wait or slow down or the one who cannot follow. The E-Bike can complete this gap. Make your holidays easy with a power-assisted bike. Enjoy pedaling across Cambodia along quiet side roads, villages and rice fields with lesser effort. Make cycling a real pleasure on whatever conditions you meet on the roads. Thanks to an electric assistance, you can achieve long distances without too much tiring. Terre Cambodge is a local travel agency that is always on the move. It was established in Siem Reap in 1998. Their dedicated team designs tailor-made trips to all corners of Cambodia. For years, their accumulated experience has helped in customizing responsible and sustainable travel that benefits both travelers and the local population. Frangipani Spa, offers a variety of massage therapies, body and facial treatments, waxing and nail care, all performed by their specially trained spa therapists. Set in a peaceful and quiet street, their spa consists of six cosy treatment rooms in the heart of the town. Frangipani is a relaxing, comfortable, family owned retreat and provides a Day Spa which is ideal after a long day at the historic Angkor temples. © 2018 E-BIKE CAMBODIA – ALL RIGHTS RESERVED – Web design by FEATHER GRAPH.